"Let's see what we're going to do with the main characters in this story," says Chris Lord-Alge at the beginning of this excerpt from his video, "Mixing Vifolly with CLA." By the "main characters," he's referring to the vocal tracks, of which there are quite a few. CLA and his assistant engineer are going through those tracks, trying to sort out what's on each one. This is a situation where he was given a session to mix that was recorded elsewhere by another engineer, so he needs to get the tracks correctly identified and configured in a way that he's comfortable with before continuing on with the mix. As you'll see in the excerpt, he will eventually route the vocal tracks through one of several sets of vocal busses (aka "subgroups"), configured on aux tracks in Pro Tools, each with the same processing. The advantage to such a configuration is that you can route multiple vocal tracks through a bus and process them as a group. It's also a lot more CPU efficient than inserting all the processors on each channel individually. 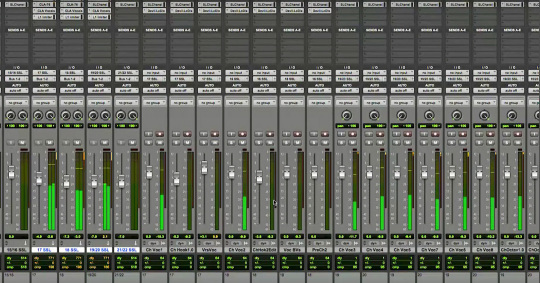 This screen capture from the video shows the way CLA has configured the vocal tracks in this session. You'll see the active vocal bus channels on the left and some of the myriad vocal tracks to the right. He sets up the first vocal bus up with the Waves SSL E Channel plug-in, which he'll use for its EQ section, in the first insert slot. In the next slot, he puts a Waves CLA-76 plug-in, which is an 1176 emulation that he collaborated on the development of. After that, he inserts another of his Waves collaborations, the CLA Vocals plug-in, which features a range of vocal processing including EQ, compression, reverb, pitch effects and delay. In the final slot, he inserts a Waves L1 limiter. 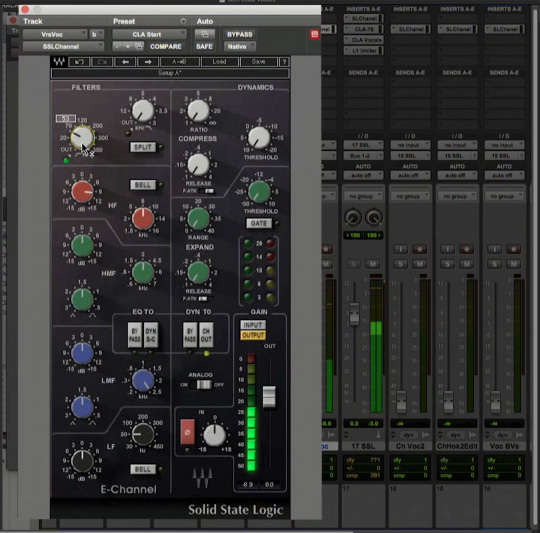 CLA EQs and filters the vocal busses using a Waves SSL E-Channel plug-in. Next, he moves to the CLA-76. He sets the Input at 30, Output at 18, and the Ratio to 4:1. The Attack is at 3 and the Release at 7. Note that on an 1176 (or an 1176 emulation like this), the knobs for attack and release are backward from what's standard. Turning them counterclockwise slows down the attack and clockwise speeds it up. In this instance, he sets a relatively slow attack and the fastest possible release. Those settings are consistent with getting an aggressive sound from the compressor, which is what CLA wants to do in this case. This shows the setting CLA likes to use on an 1176 (in this case, the Waves CLA-76 plug-in) for aggressive-sounding vocals. He says that he suspects the vocal was recorded in a bedroom or somewhere else without any real vibe to it—and without any compression or overdrive. "Plain Jane as can be," is how he describes it. He wants to give it some analog characteristics to liven it up, so he chooses SoundToys Devil-Loc Deluxe, which is a distortion/saturation plug-in. He warns that it's very aggressive, so he'll only use it lightly. He draws the analogy between the Devil-Loc Deluxe and hot sauce, you just want a little, or it will burn your tongue. He then plays the same verse section with Devil-Loc Deluxe inserted on the individual vocal channel (not the bus in this case). He sets it for a subtle amount of distortion. Next, he starts experimenting with settings in the CLA Vocals plug-in, which he uses primarily to dial in a quarter-note delay. CLA uses very subtle settings on SoundToys Devi-Loc Deluxe, which he inserts on a bunch of the individual vocal tracks. He adds the Devil-Loc Deluxe to many of the other vocal tracks. He says the vocals need to have "the most attitude possible," and he's giving them a treatment that’s “almost like a guitar amp,” with the aggressive compressor. During playback, he adjusts the Devil-Loc Deluxe settings on various channels, tweaking levels here and there, and he briefly solos the verse vocals. There are a lot of vocal tracks. He asks his assistant to move the vocal bus channels so that they're to the left of the vocal tracks to make it easier to see what's going on. He now has four vocal busses created and highlighted. He pulls down faders here and there to listen to what's on different channels. He's trying to get a sense for what's on the tracks. CLA and his assistant suspect that one of the tracks is a duplicate, rather than a double, because when it's turned on in the mix, it makes that part get louder (which happens when you duplicate a track and add it to a mix). To find out for sure, he asks his assistant to flip the phase on one of the suspected tracks, because if it's a duplicate, the tracks will cancel each other out when 90-degrees out of phase. Sure enough, there is silence when playback is engaged. When the phase is returned to normal, the audio returns. Any duplicates that he finds he will remove from the session. To determine if two of the vocal tracks (circled) were duplicates or doubles, CLA flips the phase on one of them while they play back, to hear if they cancel out. In this case, they do, so he knows they’re duplicates. He's working on assigning the lead vocals to one bus and the harmonies to another. He also decides to put the harmony processing on the lead track. He explains that sometimes you have to reconfigure the routing and processing when going through the vocal tracks of a session you're given to mix. Finally, he changes the order of the plug-ins on one of the busses to match the others, with the SSL channel before the CL-76. He says he’s reordering it mostly for the "voodoo of it," rather than any specific benefit. As CLA showed with his use of the Devil-Loc Deluxe plug-in, adding distortion to a vocal is a good way to bring some additional vibe to it. While he inserted the distortion plug-in directly on the vocal channels, there’s also another cool way to do it—add the distortion to the reverb. 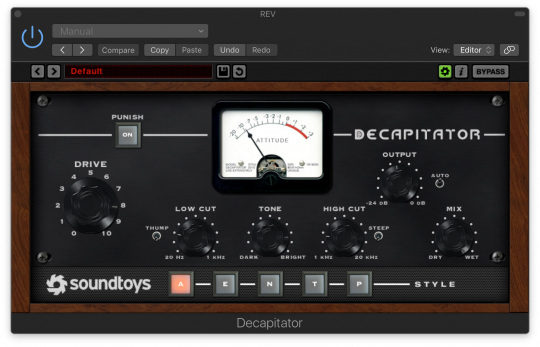 The examples here feature a reverb return channel with SoundToys Decapitator inserted after the reverb. With this method, the distortion is only being applied to the reverberated portion of the signal, rather than directly to the track. It can thicken the sound of the vocal pleasingly and, if you set it subtly, it won't sound like a distorted vocal, just a fat one. Create a new auxiliary track (aka "effects return") track, and configure a bus send to feed it. Insert the reverb you want on the aux track, and in the next insert slot, add a distortion or overdrive plug-in. (You can also try putting the distortion before the reverb if you prefer how that sounds instead.) Leave the distortion plug-in bypassed initially. Loop a section of the vocal, and turn up the reverb send on its track until you hear the reverb at the level you like. Activate the distortion plug-in, and starting with the drive turned all the way down, experiment with how high to bring it up to get the effect you want. Also, try adjusting the EQ settings you have on the plug-in. You'll probably find you get better results with the low end of the distortion cut somewhat. It depends what you're going for sonically. The following audio examples demonstrate what this effect sounds like. Example 1: First you'll hear an 8-measure vocal line with just reverb (Logic's Chromaverb on a hall setting). It will repeat a second time with Soundtoys Decapitator inserted on the reverb return after Chromaverb, with the Drive control set to about 3 and the Mix all the way up. Notice the difference in texture when the distortion is on. Example 2: Here's the same vocal line, with and without, again, but this time with rest of the instruments in. It's not just vocals that this method works on. You can use it on a lot of sources. Example 3: Here it is on a lead guitar part. Again, you'll hear it once with only reverb and the next time with Decapitator inserted after the reverb. Example 4: This is the same guitar part, but with the rest of the band in.